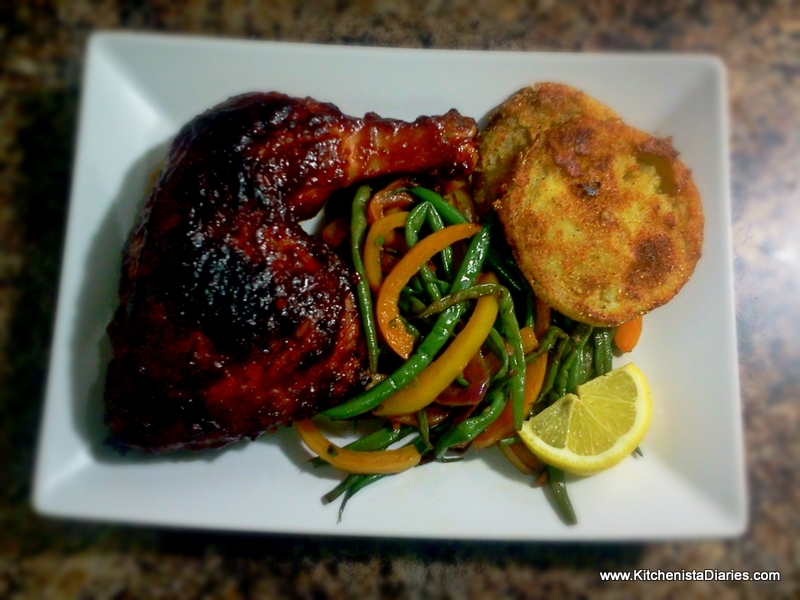 As part two of this week's Sunday Dinner series, I served a delicious vegetable side dish with my Oven Barbecued Chicken. 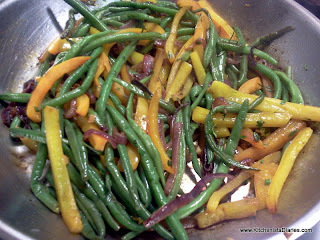 Easy to prepare and a colorful accompaniment to any entree, these green beans are sure to please a crowd. Although I frequent the farmer's market often for fresh produce, my grocery store sells bags of fresh French green beans meant to be steamed in the microwave. They're just a couple bucks, so I tend to keep a couple bags in the freezer for convenience. 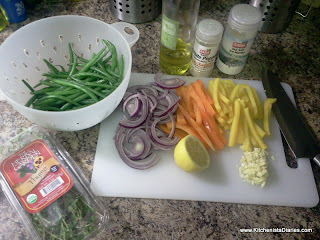 I don't own a microwave, but the quality of the veggies in those steamer bags is usually better than ordinary frozen vegetables so I use them instead. It's a great alternative to canned vegetables, and as a bonus they are already cleaned. If you use frozen green beans, place them in a colander and allow them to thaw out and air dry for a few minutes before cooking. French green beans are relatively thin so a quick saute works fine to cook them. If you substitute a generic green bean variety (they are much thicker) you should trim them, blanch in boiling water for 5 minutes, and rinse in ice cold water. 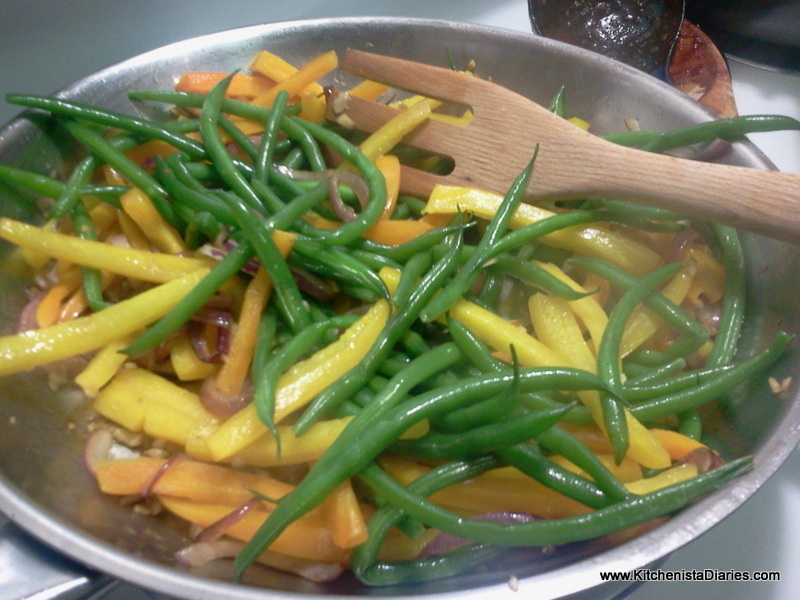 The peppers and onions should be sliced in uniform size in length and width similar to the green beans. 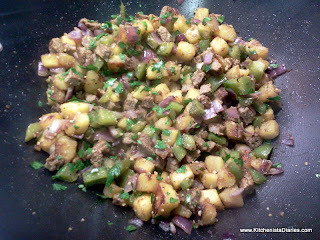 Heat the olive oil in your skillet over medium high heat, and add the onions. 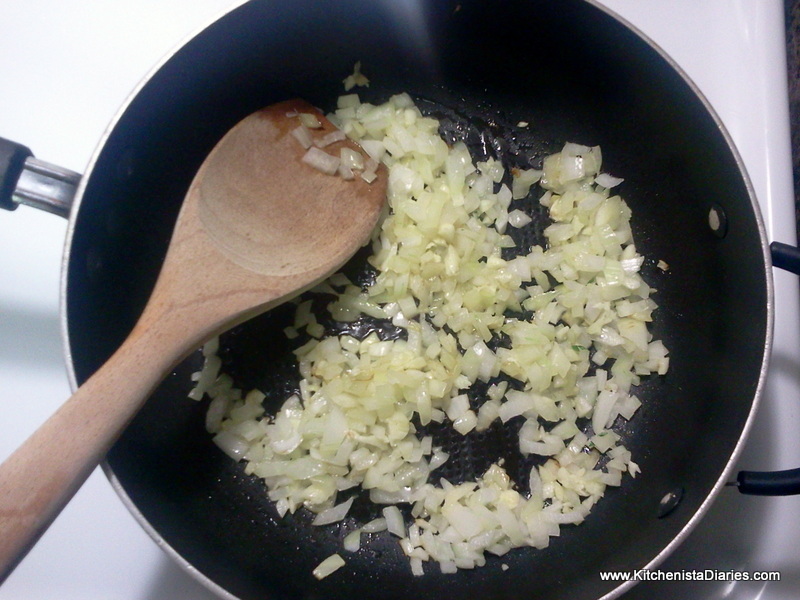 Saute until onions soften, 2 -3 minutes, and then add the garlic and a pinch of sea salt. Stir the onions and garlic and continue to saute another 2 -3 minutes, being careful not to burn the garlic. Adjust your heat down slightly if necessary. 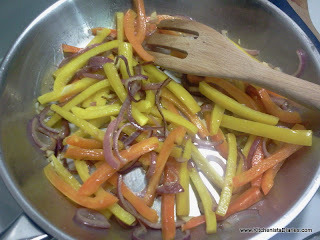 Add the sliced bell peppers and saute until crisp-tender, 2 -3 minutes. Add the green beans and saute another 3 - 4 minutes until green beans are crisp-tender and thoroughly warmed. 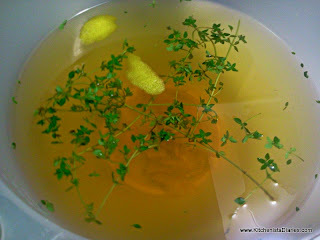 Add fresh thyme, juice of 1/2 lemon and season to taste with salt & pepper. Turn down heat. 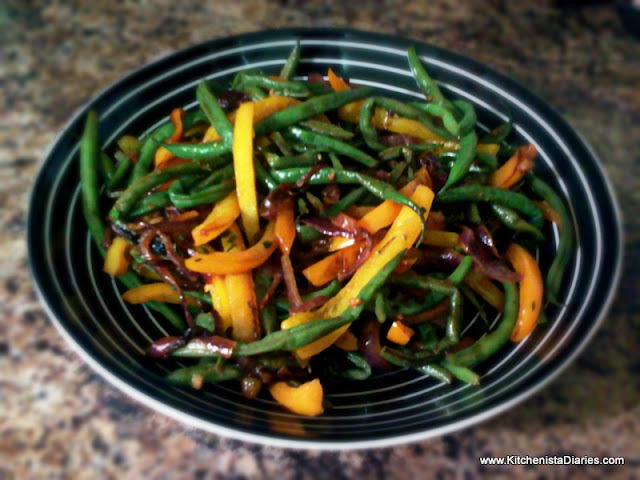 Green beans can be served immediately or allowed to cool to room temperature. 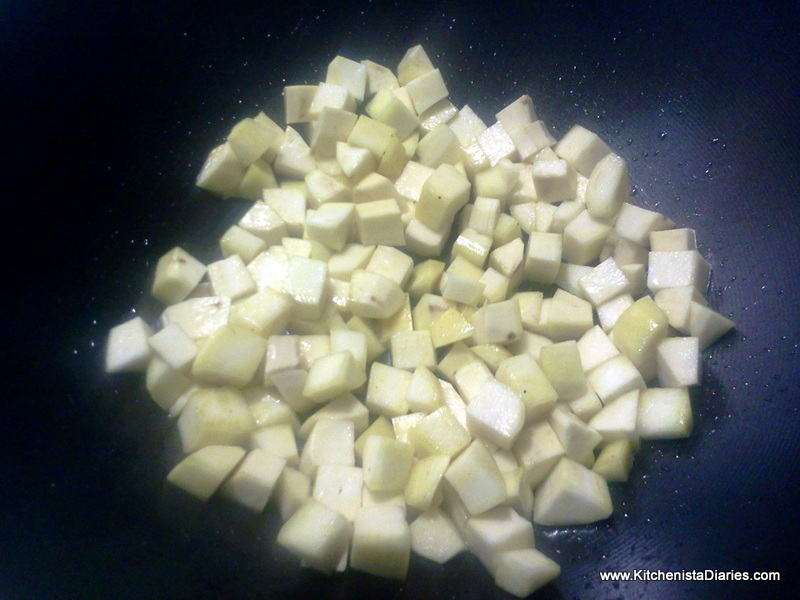 Serve with additional lemon wedges for garnish. Depending on where you live it might be too early to fire up the grill, but there's never a bad time to preheat your oven and treat yourself to a BBQ Sunday dinner. My dad did all the grilling in my house so I've gotta be honest and admit it's not something I ever bothered to practice, although I do understand some basic concepts. Maybe that's something I'll tackle in the future. In the meantime, I have a craving for barbecue that can't wait for my trip home in June! 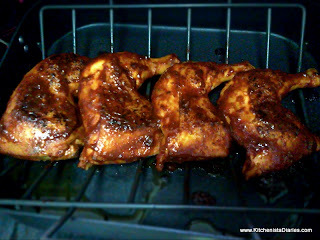 A reliable technique I've found that makes the best oven barbecued chicken is a quick sear followed by a slow roast and basting with a great barbecue sauce. Not unlike barbecuing on the grill, the trick is not to sauce your chicken in the beginning. 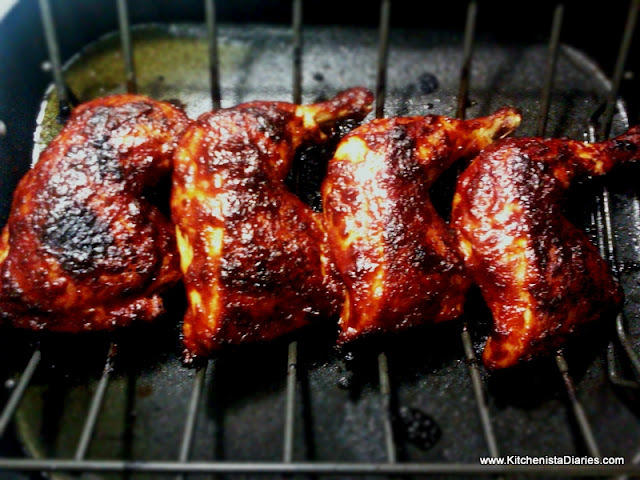 Barbecue sauce is sugary and burns fast, so you'll want to gradually baste your chicken in the last half of the cooking process. 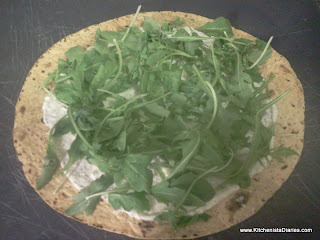 The result is just the right amount of slightly charred, crisp skin, coated in a thick layer of sticky barbecue sauce. 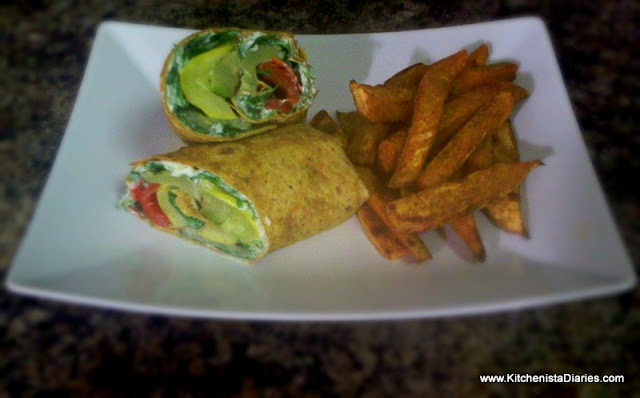 In case you haven't noticed by now, I tend to roast most of my food, both meats and vegetables. 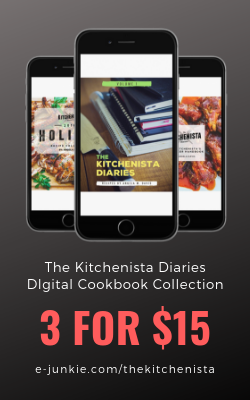 It's a healthy way to cook without using a lot of butter or oil, and doesn't require constant attention like most stove top cooking. 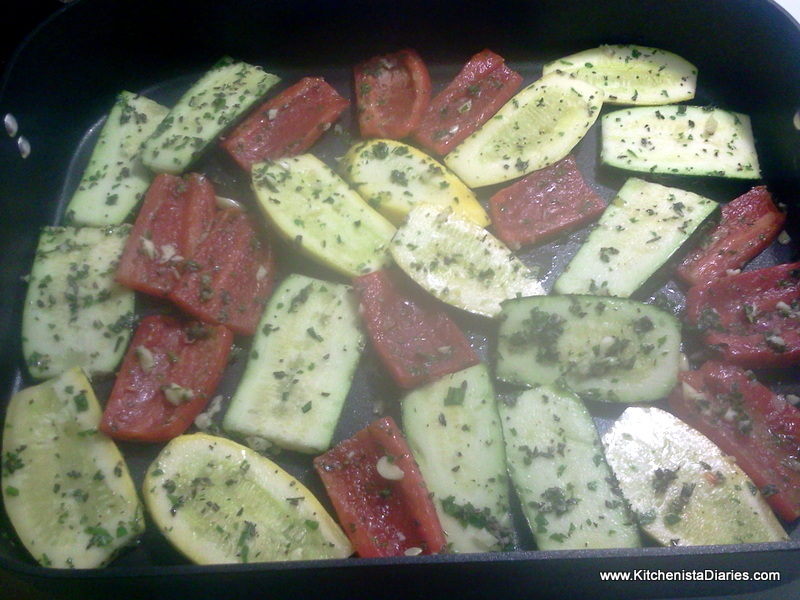 One of the best investments you can make in your kitchen is to buy a decent roasting pan. 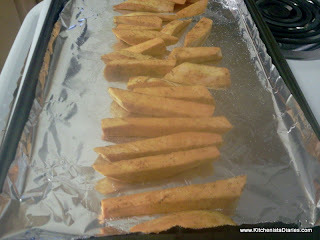 Your food will roast evenly in a good, heavy pan as opposed to using a disposable foil pan or baking sheet. My Calphalon Unison Nonstick 16" Roaster was a gift from my parents that I'm still raving about, four years later. Even though the removable rack was intended for larger pieces of meat (like whole birds), I've found it works great for roasting chicken quarters. 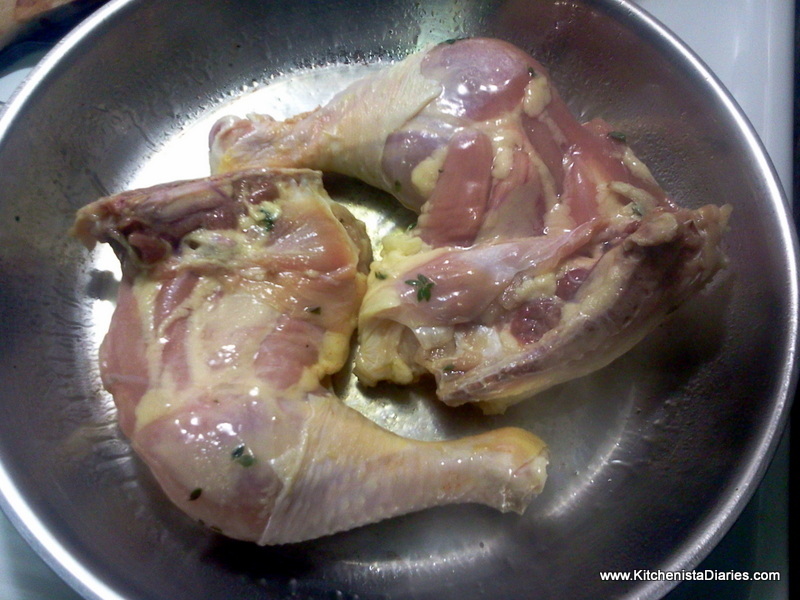 Because it lifts the chicken above the surface of the pan, fat drips away from the meat. 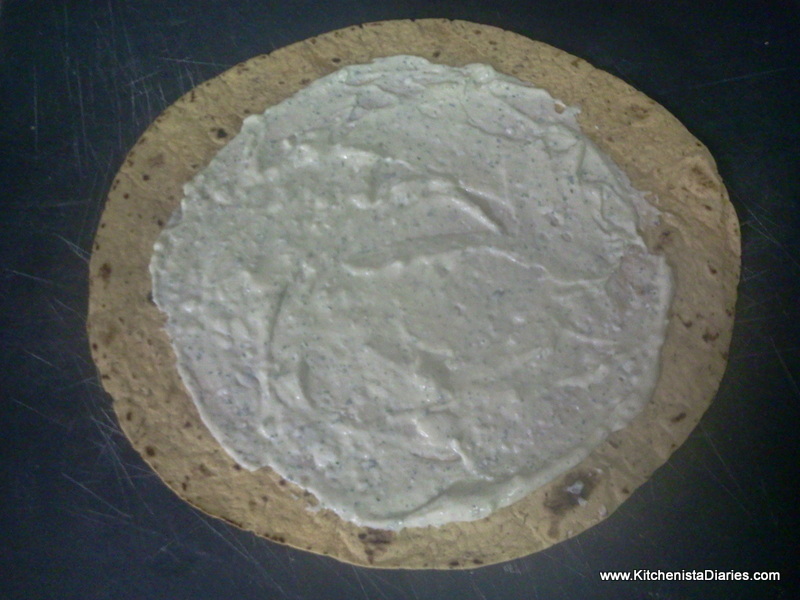 This means less grease and a crispier skin, both top and bottom. When I'm not going to be roasting vegetables alongside my meat, I like to use the rack for that reason. I didn't mention the best part yet... 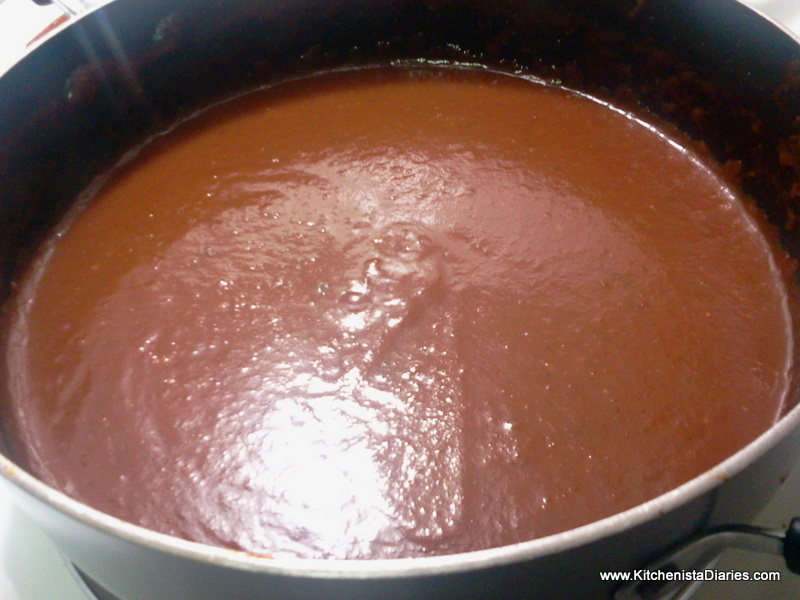 I made my own barbecue sauce for the first time! When you realize how simple that is to do, you'll want to make yours too. 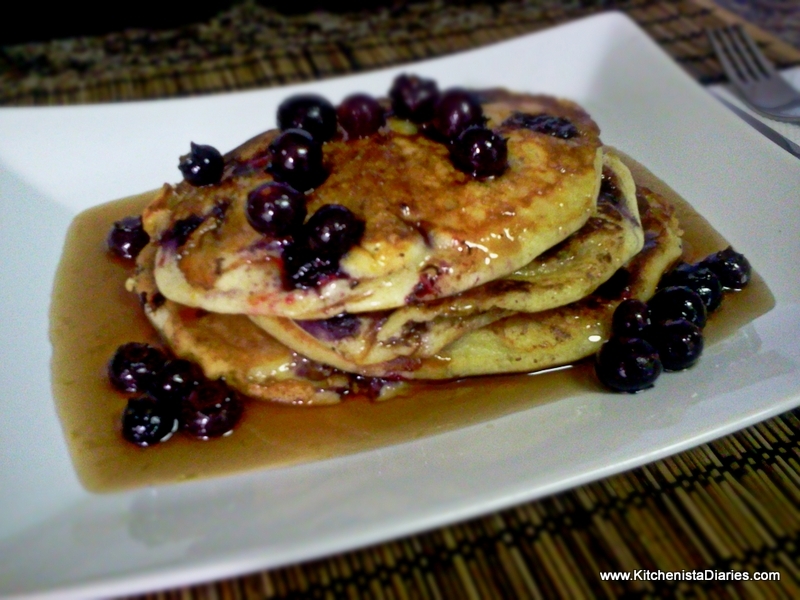 You probably already have most of the ingredients in your pantry. Yes, you could just pull out your favorite bottle of store-bought barbecue sauce. You could even spruce it up a little bit with your own herbs or spices. Taste wise, nothing wrong with that. But here's the catch: Most commercial condiments are made with a ton of preservatives, artificial dyes, high fructose corn syrup, and chemicals I can't pronounce. I don't know about you, but I'd rather be able to identify exactly what went into the food that I eat. The convenience of picking up a bottle at the grocery store is often trumped by the health benefits and cost-savings of taking a little extra time to make dressings, sauces and dips from scratch at home. 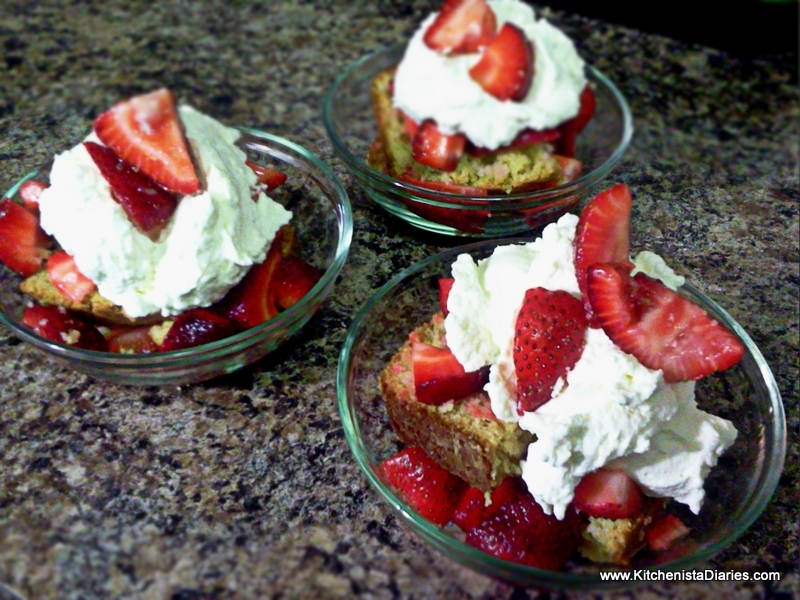 This is a three-part post featuring the main entree along with two recommended side dishes that together make a perfect Sunday dinner. You'll find the recipe to the Oven BBQ Chicken here, but definitely continue on to check out my separate posts on the Green Bean Medley and Fried Green Tomatoes. Both side dishes are quick and easy to make, so use the time that the chicken is roasting to prepare them. The recipes themselves aren't complicated - we're talking basic cooking techniques - however there is a little bit of a time factor to consider in brining the chicken beforehand. You could skip that step, but I really believe the three hour brine made the difference in this unbelievably juicy, flavorful chicken. 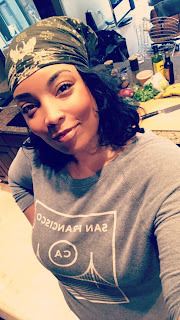 It was the first time I ever tried brining and now I'm excited to try it on a whole chicken or turkey, so stay tuned for that. Needless to say I was feeling proud of myself knocking out two cooking "firsts" in the same meal! 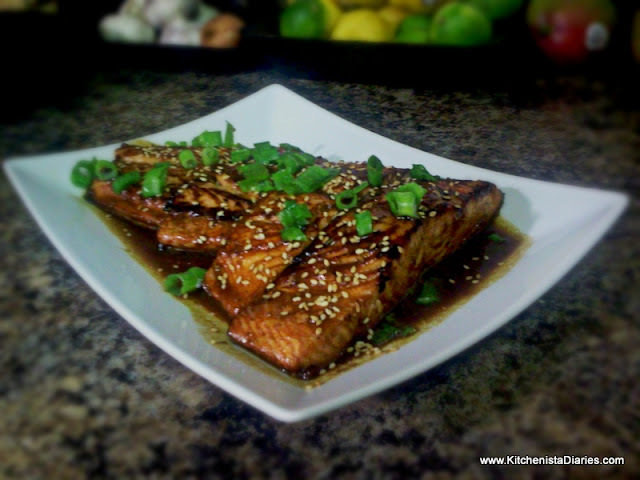 To prepare brine, add brown sugar and salt to the warm water and stir until dissolved. 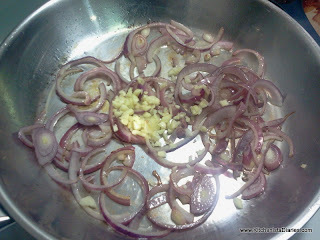 Add crushed garlic, thyme and lemon peel. Allow to cool completely before using. Add chicken to the brine if your container is large enough to fit it and has a tight lid. 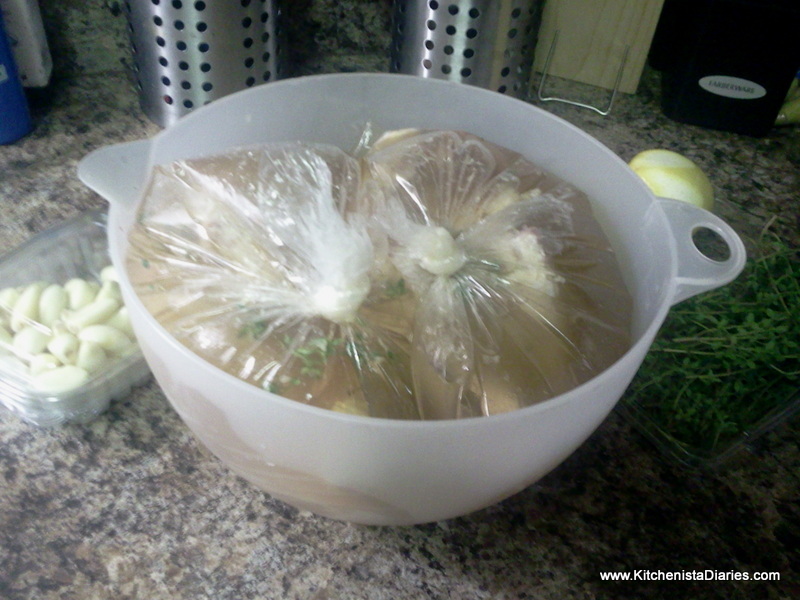 Otherwise, use large plastic bags to hold the chicken and brine. 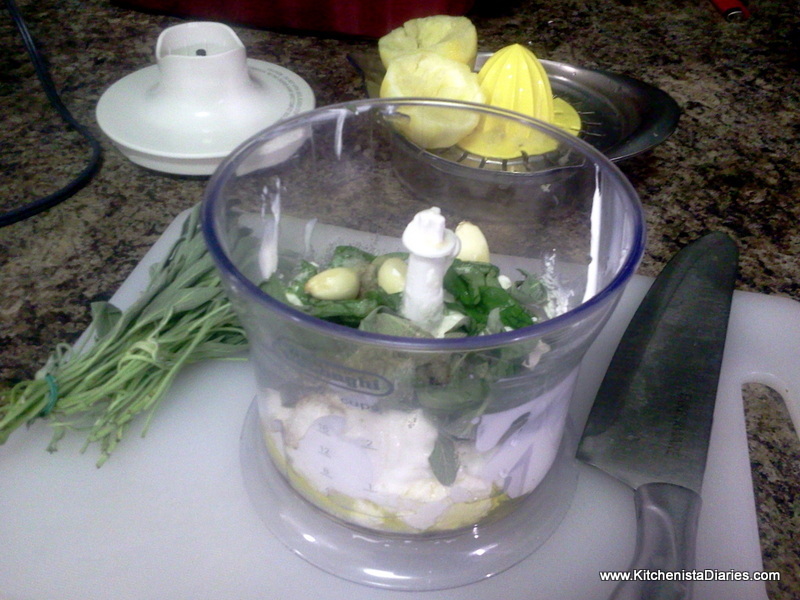 Make sure the chicken quarters are completely immersed in the brine. 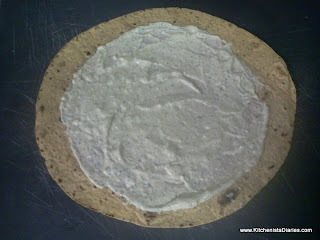 Refrigerate for at least 30 minutes and up to 3 hours. The salt in the brine works by breaking down some of the tougher proteins and forcing the meat to retain fluid, thus keeping it moist and juicy when cooked. For this reason, brining too long can result in mushy meat so it's not something you would let sit overnight for smaller cuts of meat such as chicken quarters. While the chicken brines you can make your sauce. 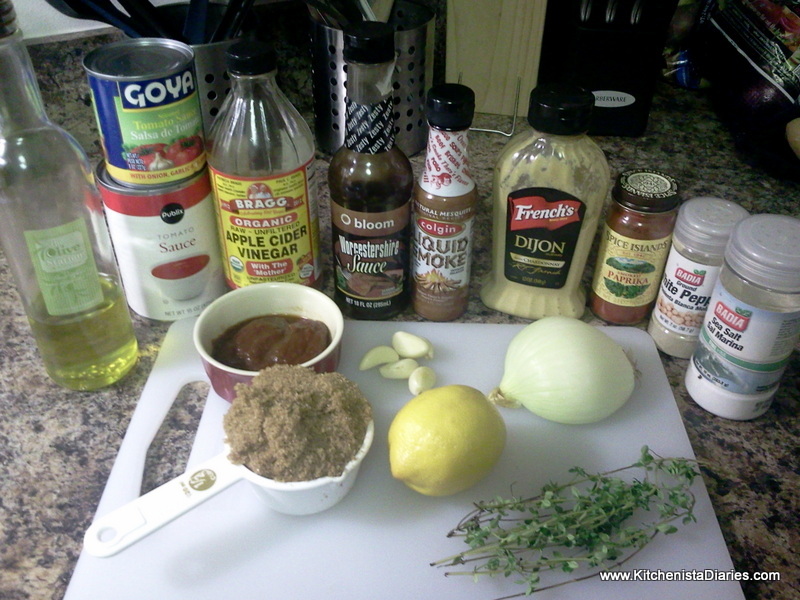 I started out with basic ingredients for a barbecue sauce and then added my preferred seasonings to get the finished product. Honey (not pictured) was added at the very end to sweeten the sauce a bit. 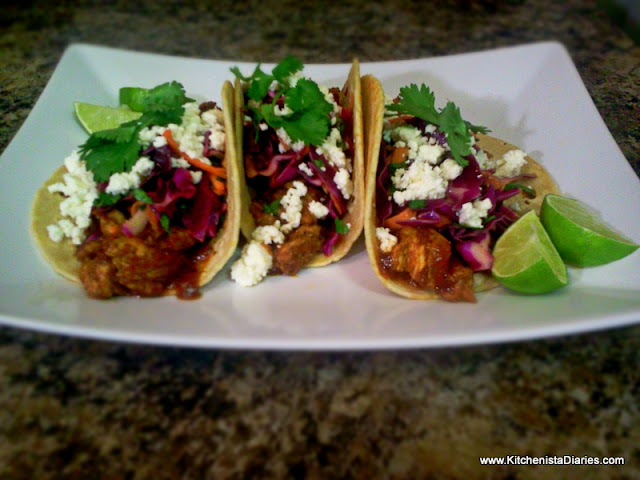 Depending on how many chipotle peppers you use, you may or may not want to sweeten it as much. 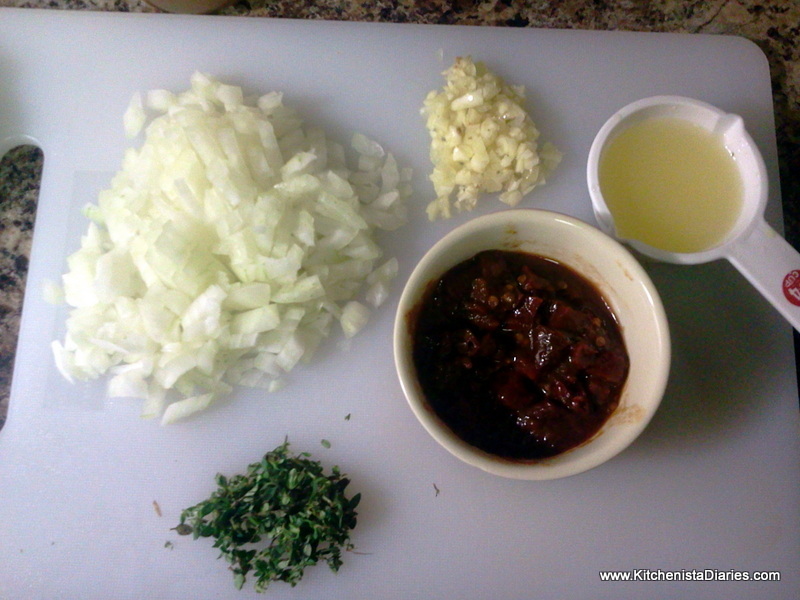 Minimal prep; besides having your seasonings handy you'll want to squeeze your lemon, dice the onion, chop the chipotle peppers, mince the garlic, and chop the thyme (remove all stems.) The chopped chipotle peppers should be kept with the adobe sauce as that adds some depth and heat to the barbecue sauce - use as little or as much as you would like. 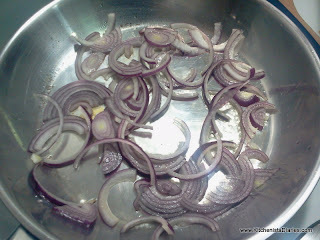 In a sauce pan over medium heat, add a little olive oil and saute the onions and garlic until soft and golden brown. 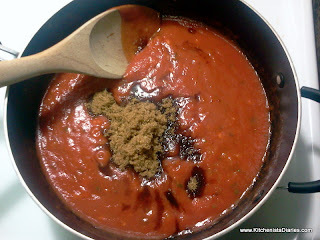 Add tomato sauce to the pan. 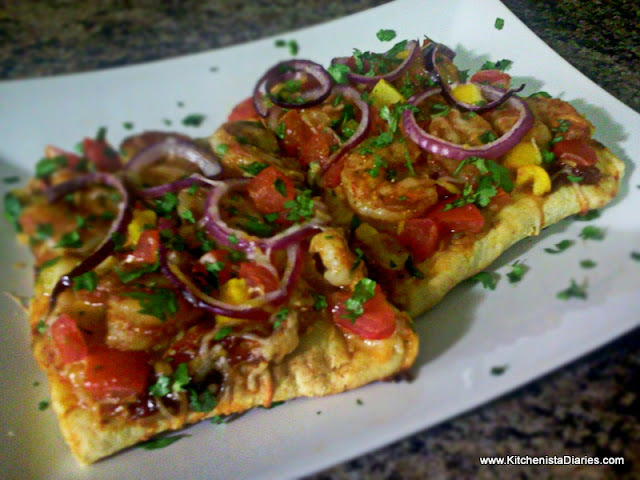 I used a regular sized can of plain tomato sauce, and a small can of tomato sauce with Spanish seasonings - garlic, onion, and cilantro. The hint of cilantro goes well with the flavors of the barbecue sauce without overpowering it as fresh cilantro might have. Turn down heat to medium-low and add the dark brown sugar. 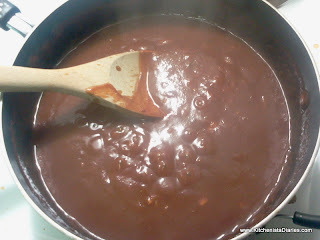 Besides sweetening the sauce, this adds a great dark color. Stir until all sugar is dissolved with no clumps. 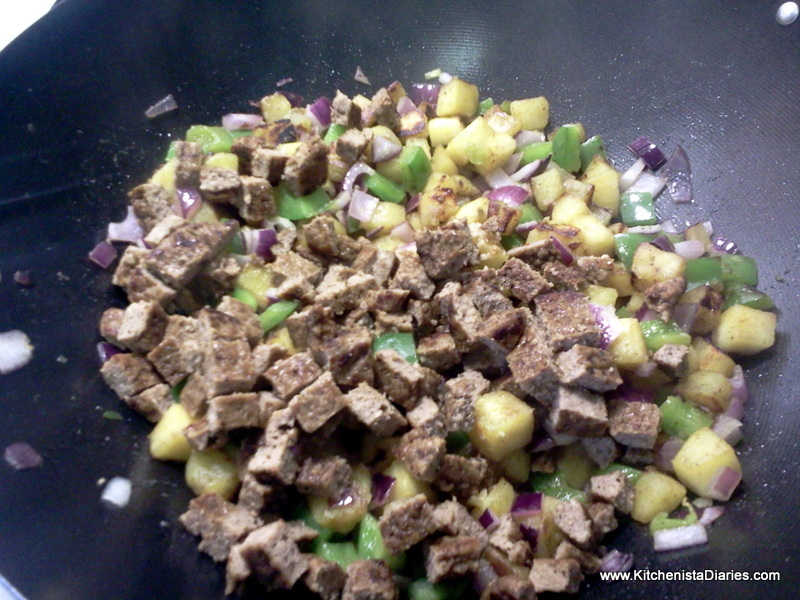 Add Worcestershire Sauce, apple cider vinegar, lemon juice, Liquid Smoke and chipotle peppers. Continue to stir. If you don't have Liquid Smoke or can't find it that's not a dealbreaker, it just helps to enhance the flavor that otherwise would have been added by the smoke of an outdoor grill. Now it's starting to smell, look and most importantly taste like barbecue sauce. 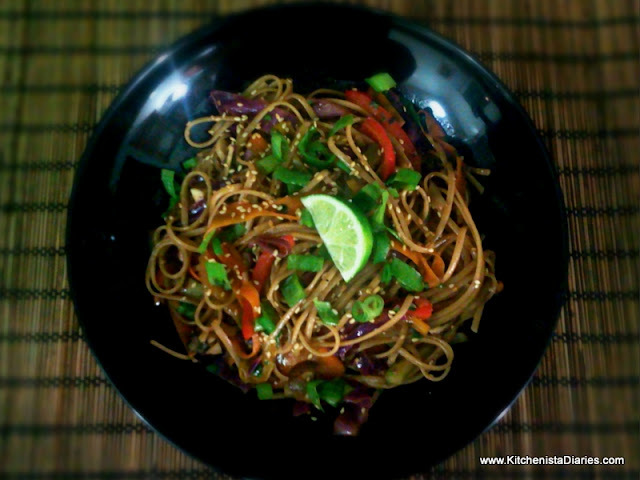 I say this often and I'll say it again: taste your food while you're cooking it. It is the only way to be sure you're on the right track. Add the remaining ingredients and season to taste. This is when I decided to add honey to sweeten the sauce up a bit and get it to the consistency I wanted. 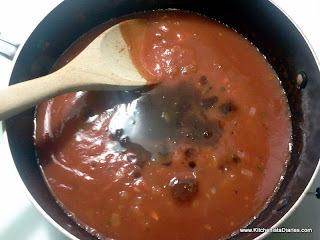 Allow the sauce to simmer on low heat for at least 10 minutes. The final step is to puree the sauce to make it smooth. 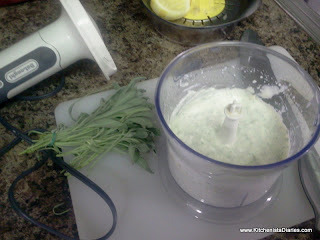 You can allow it to cool and pour into an upright blender, or make your life easier by using a hand blender in the pan. Again, it won't change the sauce dramatically if you skip this step, I just prefer not to see large bits of onion and garlic. If you want a rustic sauce feel free to stop at this point. The result? 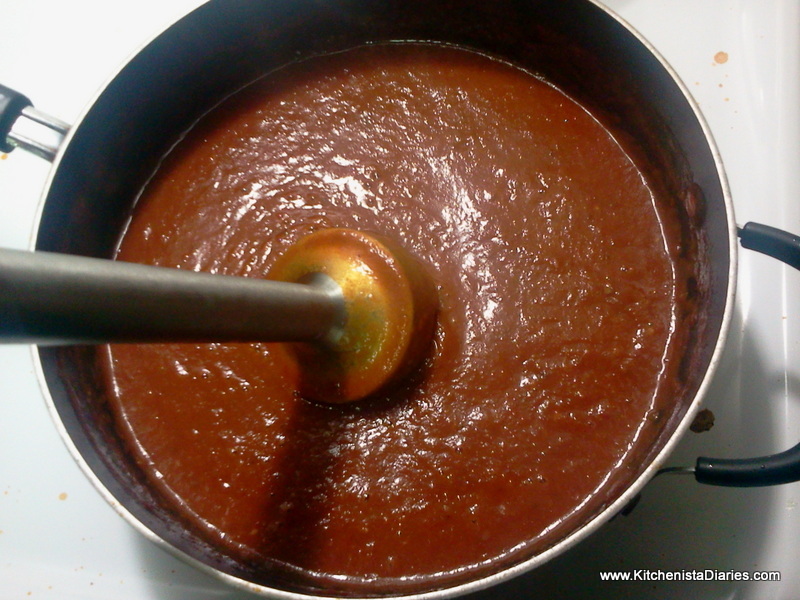 A rich, smoky, barbecue sauce that is both spicy and sweet. 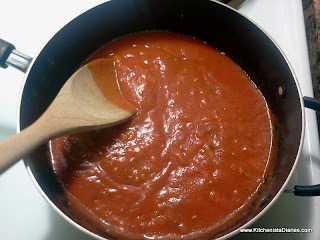 Recipe makes just about 2 1/2 cups, so store any extra sauce in a resealable jar and refrigerate. When the time is up for the brined chicken, preheat your oven to 400°. Remove the chicken from the bags and discard the brine. 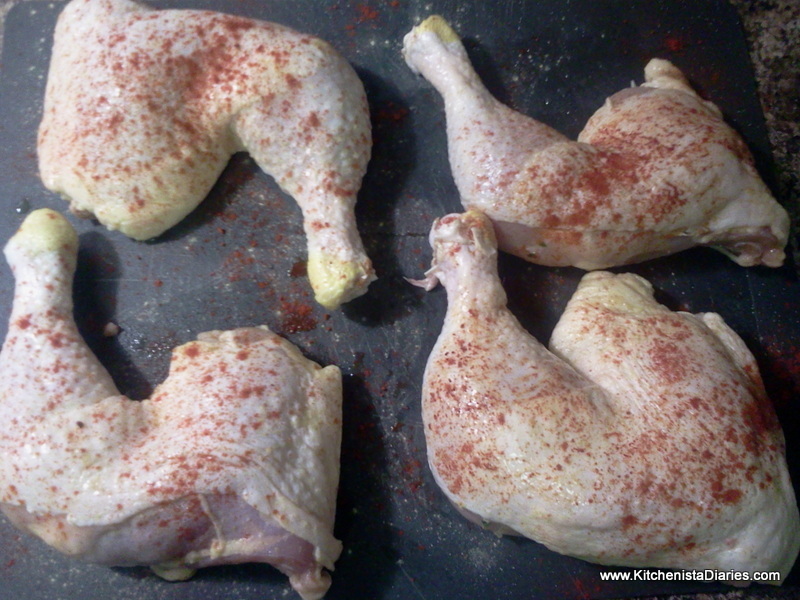 Rinse the chicken off in cold water and season the skin lightly with smoked paprika. I used a garlic infused oil in the next step, but as an alternative you could season with a pinch of garlic powder now. 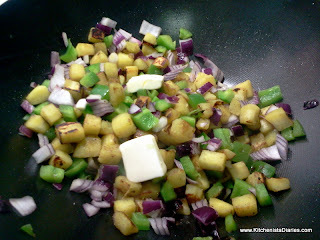 To a pan heated over medium high heat, add a couple tablespoons of olive oil. 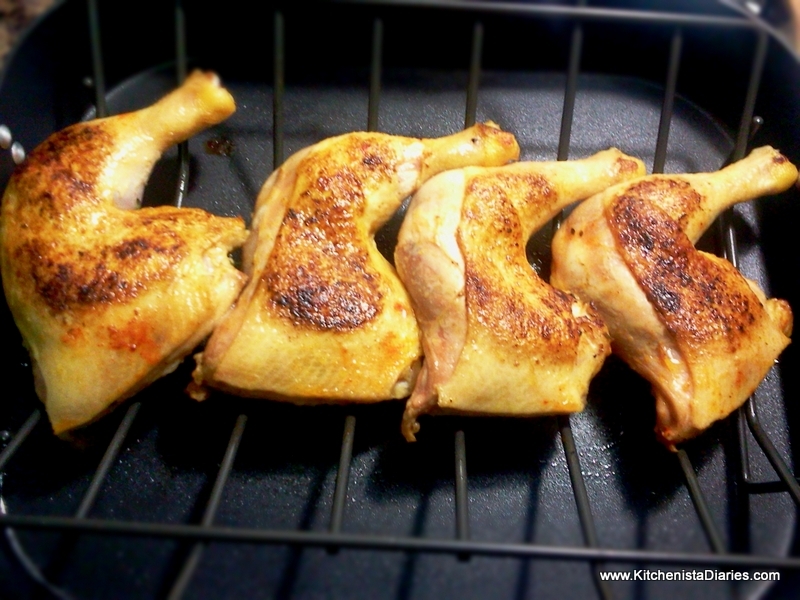 When the oil is hot and starts to shimmer, place your chicken skin-side down in the pan. I only had room for two so I did this in batches. Don't crowd your pan, the skin needs to make contact with the hot surface in order to sear properly. After 2 - 3 minutes you should have a nice crust formed on the top of your chicken. 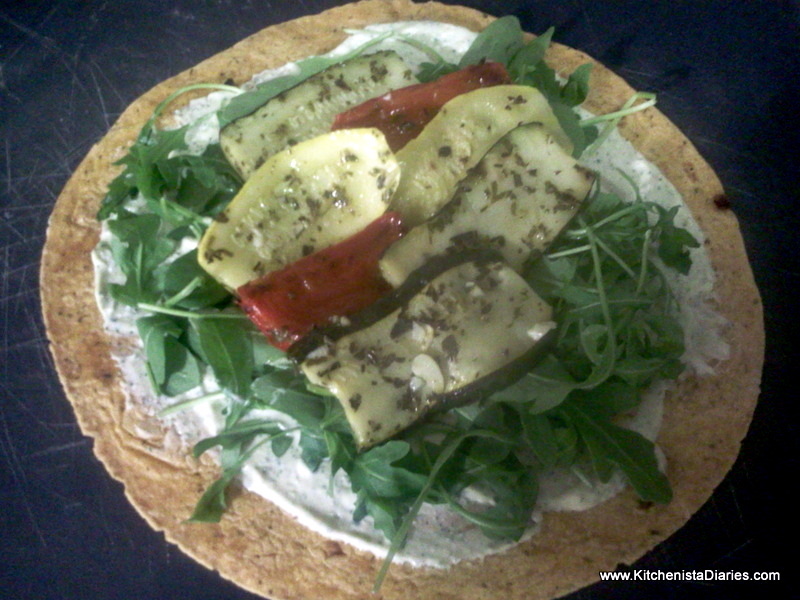 Remove from the pan and place on your roasting rack in one layer. Roast the chicken for 10 -15 minutes until golden brown. Remember, you do not need to add sauce at this point. Remove the pan from the oven and lightly baste your chicken in barbecue sauce, both top and bottom. Instead of using a brush, I simply poured a little sauce into a small bowl and dipped my chicken one by one. If you do it that way, make sure you are using sauce in a separate bowl as dipping it into the entire pot of sauce would contaminate it with uncooked chicken. Return the chicken to the oven and roast another 10 minutes. 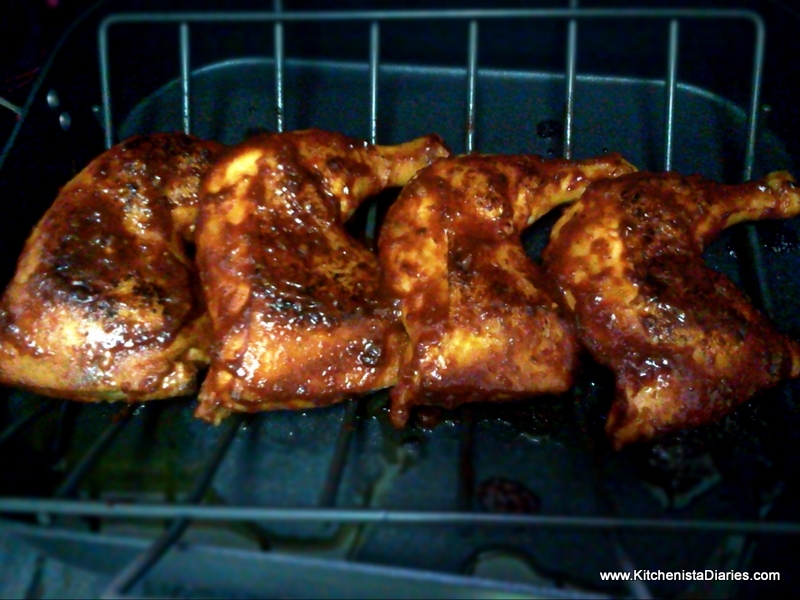 Baste the chicken again in barbecue sauce. As the chicken roasts, you'll notice the sauce will darken in color and start to get thicker and stickier. 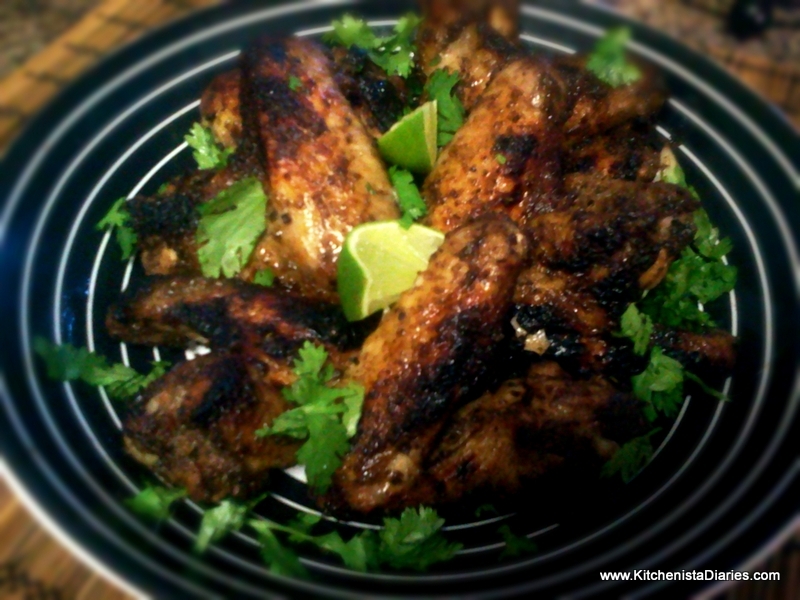 I basted with a heavier application of sauce in each round. 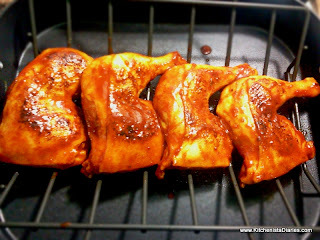 Don't worry about the sauce dripping into the pan, because of the sugar content it may burn a little but because you're using a rack it won't affect the chicken at all. You'll continue this pattern of roasting 10 minutes followed by basting with barbecue sauce for a total cooking time of 40 minutes, or until the thickest part of the chicken reaches 165°. Do yourself a favor and get a meat thermometer, you can find them starting around $10 at the grocery store and they are indispensable for cooking larger pieces of meat properly. When the chicken is fully cooked, baste with a final application of barbecue sauce and transfer it to a serving platter or cutting board. Allow the chicken to rest for at least 5 minutes, this helps to retain the juices. For a southern style Sunday Dinner, try completing this meal with fresh veggies, warm buttered cornbread and iced tea or lemonade. I recommend pairing with my recipes for a crisp Green Bean Medley and tasty Fried Green Tomatoes. Even in the dead of winter, you'll swear you've been transported to a barbecue on a hot summer day! Mornings are a mad dash to get to work on time, so a quick egg sandwich is my go-to breakfast if I eat anything besides fruit. My son's idea of a "real" breakfast on the weekends is the typical American feast of scrambled eggs, sausage, and hash browns or pancakes, which totally conflicts with my plans to sleep as long as possible on my days off. I blame the grandfather for spoiling him. I'm not a morning person and I probably never will be, so breakfast just doesn't do a whole lot for me - that said, I think it's important to have a few easy but impressive dishes up your sleeve that are great for serving company or hungry children. So in my effort to present a diverse repertoire of recipes for the Kitchenista Diaries, I got up to cook breakfast this morning. First, a note regarding the ingredients. 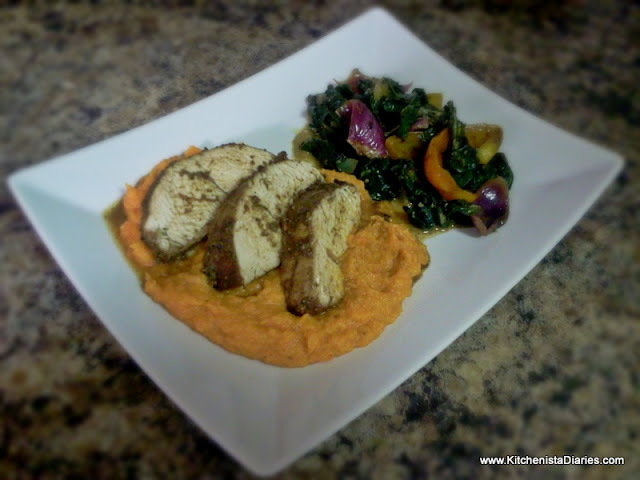 Orange-fleshed sweet potatoes would work fine for this, I just used what I have on hand. I also like the surprise factor of a dish that looks like it's made with white potatoes but hits you with a touch of sweetness. Likewise, pork sausage, chorizo or linguiça would be okay if you don't have turkey sausage, but there's a trade off on fat/calories. I used coconut oil which does add a layer of flavor to the hash, but olive oil or grape seed oil would be fine if that's what you have. Cook your sausage per package instructions. Prep your other ingredients while sausage cooks. 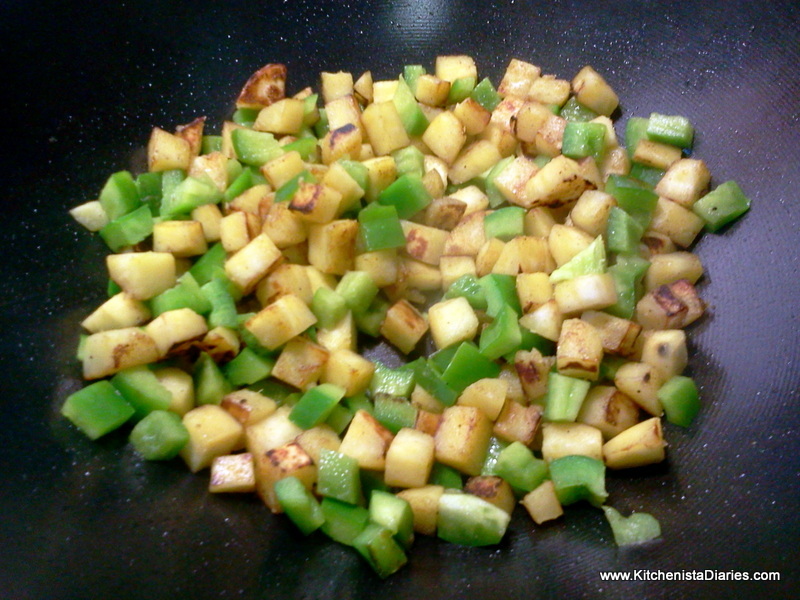 The potatoes, peppers, and onions should be diced in uniform size. 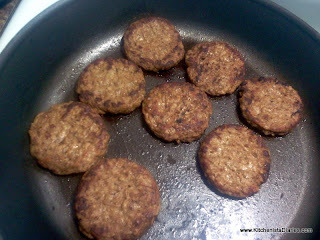 After the sausage is cooked, wipe the pan clean and dice the sausage. Notice the missing sausage patty in my picture? Little man couldn't wait to eat! 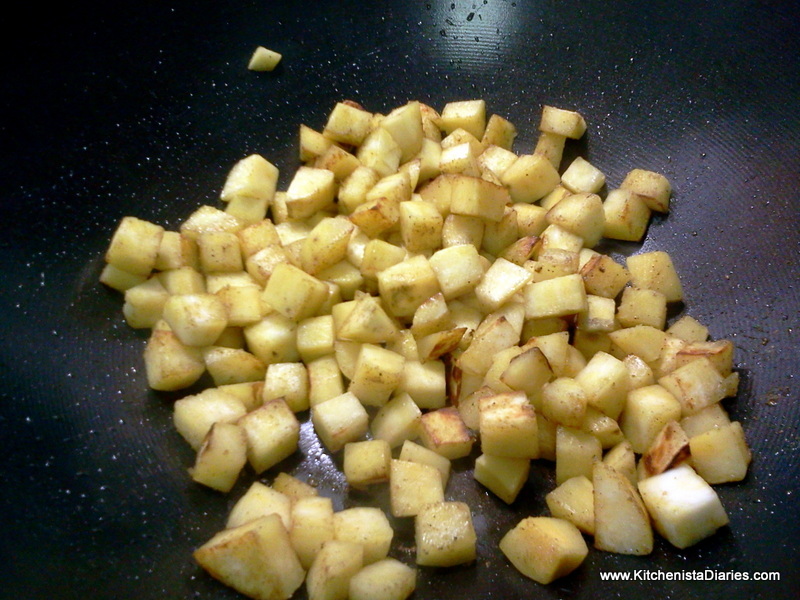 As potatoes brown, season with salt, pepper, cumin and coriander to taste. I went light on the cumin and coriander, too much tends to burn faster and discolor the dish. Add the diced bell peppers and cook until peppers are tender crisp, 2-3 minutes. Add the diced onions and cook until onions soften, 2 -3 minutes. My potatoes had absorbed all the oil at this point so I added a couple pats of butter for both flavor and to grease the pan. 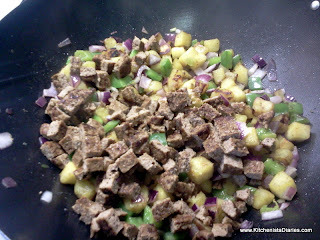 Add the cooked sausage, garlic, and red pepper flakes. Toss well and cook until sausage is warmed, 1 -2 minutes. Adjust seasonings as needed and finish with fresh parsley and cilantro. 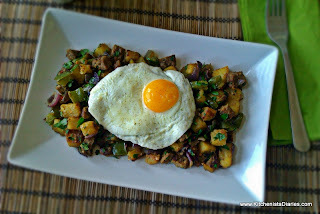 As pictured, I served my hash with a fried egg sunny side up. 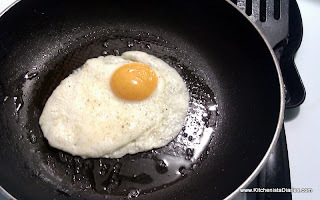 Tip for a great fried egg: butter, low heat, and slow cook - it's actually more of a simmer than a sizzling fry. Baste the top of the egg with butter while cooking and remove from pan when egg whites are set, about 5 minutes. 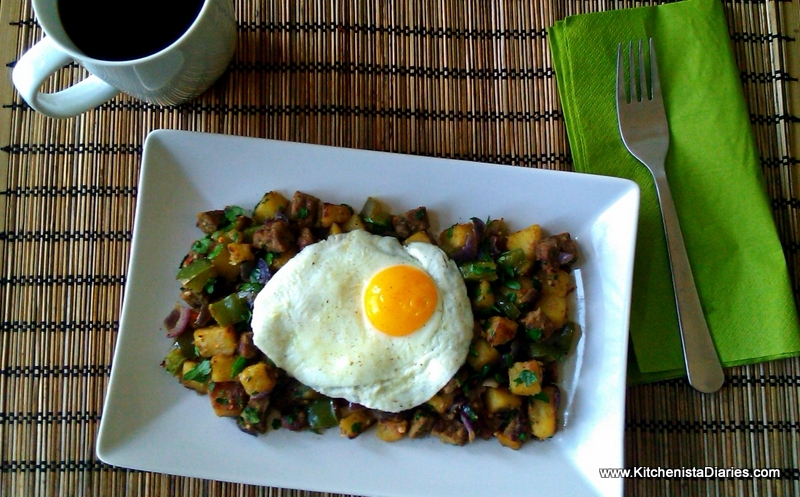 Gently slide your egg over the hash, season with salt and pepper and serve!